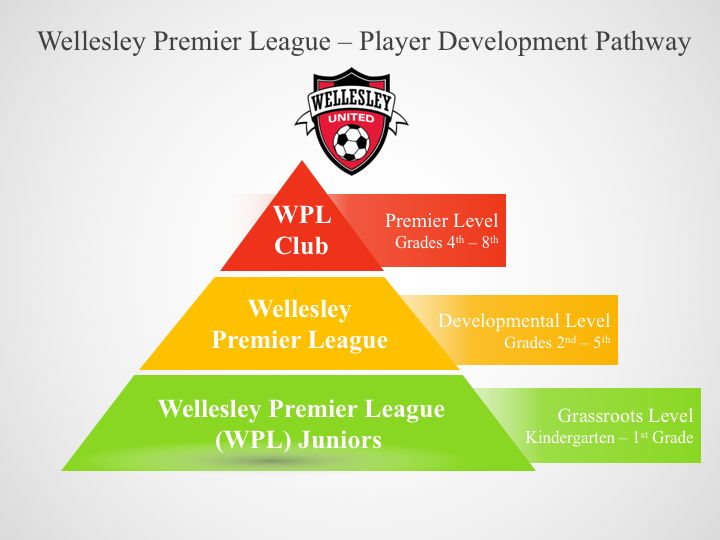 The Wellesley Premier League Club (WPL Club) program was formed in Fall 2017 with the mission to offer higher level coaching and team training in a professional club and competitive league setting. The WPL Club teams participate in the Northeast Soccer League (NSL) and includes weekly schedules trainings and games, along with tournament opportunities. All of our club teams are coached by experienced and knowledgeable New England Revolution Academy coaches. Age Groups/Genders: Wellesley Premier League is available to all children grades 4 & 5 (grade based) and for Grades 6-8 (calendar year based). Team Selection: Teams are grouped into divisions based on age, gender and level of play and a pre-season Assessment session. Training: Practices and/or training sessions are generally held once or twice per week with a focus on continued development of core skills (dribbling, passing, receiving, shooting) along with other age appropriate tactics & skills. Seasons: Fall (Outdoor), Winter (Indoor) and a Spring season (Outdoor).